It was announced this week that one of Israel's most polarizing political figures, the ultranationalist Avigdor Lieberman, will assume the post of Israeli Defense Minister. Mr Lieberman — a former Israeli Foreign Minister and nightclub bouncer from Moldova — is known for propagating an array of controversial policies, such as the forced relocation of Israeli Palestinians into the Occupied Territories. Concerns have increased that his appointment to a significant government post may herald a new era of oppression against the Palestinians, and a more belligerent policy toward regional powers like Iran. Israeli Prime Minister Benjamin Netanyahu (R) and Avigdor Lieberman (L), the head of hardline nationalist party Yisrael Beitenu, are seen during a ceremony in which they signed a coalition agreement on May 25, 2016 at the Knesset, the Israeli parliament in Jerusalem. Israeli Prime Minister Benjamin Netanyahu's decision to choose Lieberman and allow the Yisrael Beiteinu party to join the government has been met with scathing comments by Israeli officials, such as Former Defense Minister Moshe Ya'alon, who bemoaned that "extremist and dangerous forces have taken over Israel." Opinion polls indicate that the Israeli public is also ambivalent about the re-emergence of Lieberman, with 29% backing him, and 50% preferring Ya'alon. How much Lieberman's presence will alter the dynamics of Israeli politics has become the object of much speculation. While the appointment of right-wing Lieberman is a blow to the centrist forces in Israeli politics, such as the 'Zionist Union Party' — which was slated for the coalition position until Netanyahu reneged and chose Lieberman — some analysts have argued that the situation for the Palestinians would remain dire, and Israeli regional policy confrontational, regardless of who fills the position of Defense Minister. "People are talking about how this is the most right-wing government in Israel's history, but it does not matter to the Palestinians if the government is right-wing, or left-wing; the policies remain the same, the injustices and grievances remain the same. So I don't think that Lieberman will change anything on the ground that isn't already happening," political analyst Sharif Nashashibi told Sputnik. There is however, due concern that some of Lieberman's divisive rhetoric and policy prescriptions may worsen Israel's treatment of Palestinians. "on the brink of madness". Most recently, Lieberman called for the imposition of a controversial bill allowing the death penalty of Palestinians who are convicted of "terrorism" — a term often vaguely applied to those resisting the occupation. He also infamously said that disloyal Israeli Arabs should be "beheaded." Israel's new Defense Minister Avigdor Lieberman, 2015: "Anyone who thinks going back to the 1967 lines will solve the conflict is autistic." 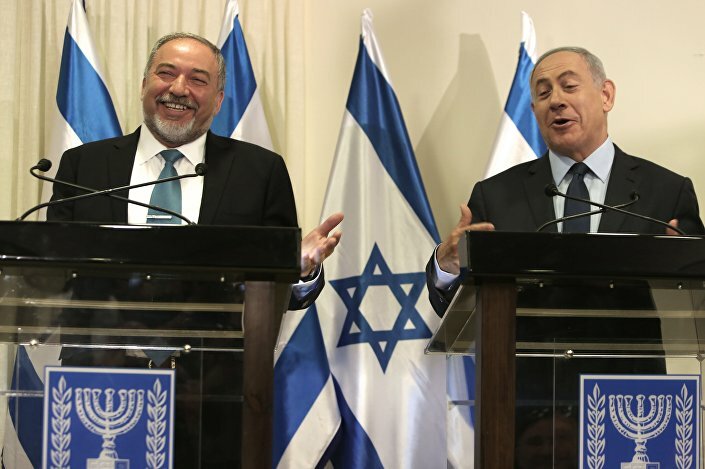 While Lieberman may not be able to call the shots over Netanyahu, he has often criticized the Prime Minister for "not being tough enough on terrorism," and for not preventing the Iran nuclear deal. There are concerns that Lieberman will pressure the government into a more aggressive military policy to demonstrate to his constituency that he can put words into action. "Not only is Lieberman appealing to the most right-wing constituency in Israel, but he is a politician that needs to expand the outreach of his political party. Now that he is the Defense Minister, he needs to back his rhetoric with actions as far as his supports are concerned. It is difficult to imagine that as Defence Minister, Lieberman will abandon his style of politics and sideline his personal political ambitions," Ramzy Baroud, a Palestinian scholar and journalist told Sputnik. In terms of regional policy, Lieberman has shown more belligerency in his rhetoric than former Defense Minister Ya'alon. In regards to Iran, he previously claimed that, "to deal with the Iranians, you need to know how to make difficult decisions. You need to shoot, don't just talk." He has also followed the US neocon position by saying that "Iran poses the most dangerous threat to the world order." Such statements would suggest that Lieberman could be more willing to deploy the Israeli military than Ya'alon. "Lieberman may make more strongly-worded statements vis a vis Iran or Syria, but in essence his view on policy toward those countries does not differ fundamentally from the rest of the Israeli government — it is one of confrontation. The difference is in the style of his rhetoric not the substance of the policies," Nashashibi said. Another point of concern is that Lieberman lacks the military experience of his predecessor, increasing concerns that he may unfit for making tough decisions on when to deploy the military. Professor llan Pappe, a scholar on Israel, said that, "the Israeli military are rightly worried that he [Lieberman] will send them on missions that not even they can accept. It could be a moment of truth for them, if they want to save what remains of Israeli democracy." "What is particularly dangerous about Lieberman is that he doesn't come from a military background. Military people tend to assess situations in a more realistic fashion, while demagogue politicians tend to pursue policies that appeal to their followers without carefully measuring the consequences of their actions. While the Israeli army has always been violent, it is consistent with the political mood of the country. Lieberman is likely to challenge that order, and engender further violence." It was only last month that Lieberman promised if he became Defense Minister, he would kill Hamas' leader in Gaza, Ismail Haniyeh, calling on Haniyeh to "simply reserve a grave in the nearest cemetery." In the final moments of the interview, Pappe despairs at how, "despite his murderous language and violent policies, Lieberman has largely been tolerated by the US and the West in general." He then expresses his certainty that, "now Lieberman is heading a violent institution [the Israeli army], he is very likely to leave a mark, and it will be a bloody one." One way or the other, Israel's new Defense Minister will surely leave a mark — whether it will be a bloody one remains to be scene.